While preparing a nutritious dinner can be tricky when you lead a busy lifestyle it is no excuse to stop eating foods that will truly benefit your health. One of my favourite go-to dinners that I prepare every week is my Dijon Salmon. It is simple, quick and packed with healthy omega 3 fatty acids, which over time you will discover I am a big advocate of. I prefer to use organic salmon for this recipe. While there might be controversy on the subject, I do believe that eating organic when possible will benefit your overall health in the long run. A great alternative to organic fish is wild fish. Unfortunately, it is not that common to come across wild salmon at the local grocery store. That really leaves us with two options, farmed salmon or farmed organic salmon. The food quality and standards for the organic salmon are simply much higher and after eating it for so long I can actually taste the difference between the two. All of that said, I still think it is better to consume any type of salmon as opposed to none at all. I do hope that all of you try this recipe with whatever fish you prefer and let me know your thoughts! 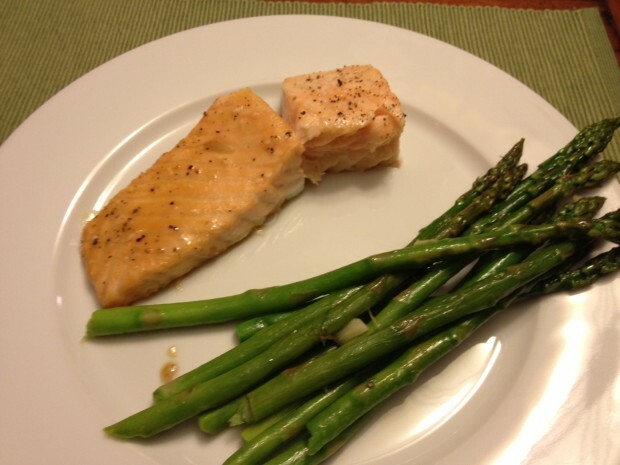 Cook salmon on 350F for 20 – 30 mins (depending on your preference) and enjoy!